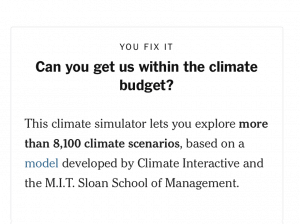 The new interactive tool in the New York Times, “You Fix It: Can You Stay Within the World‘s Carbon Budget?” gives you the power to explore over 8,000 scenarios for addressing climate change. For many, experimenting with the opinion piece can be a challenging experience. We recommend that you watch this video or read this post on ten reasons for climate hope and learn more about Multisolving, our community-level response to the climate and sustainability challenge. The model, framing, and data behind the NY Times interactive were created by the three authors — Andrew P. Jones, Stuart A. Thompson, and Jessia Ma, with the full Climate Interactive team: Shanna Edberg, Tom Fiddaman (Ventana Systems), Todd Fincannon, Travis Franck, Ellie Johnston, Andrew Jones, Skuk Jones, Stephanie McCauley, Grace Mwaura, Phil Rice, Juliette Rooney-Varga (Mass-Lowell Climate Change Initiative), Elizabeth Sawin, Lori Siegel, and John Sterman (MIT Sloan). it to the UN negotiations, or try it out for yourself for free. The carbon budget value in the interactive (2900 GtCO2 cumulative) comes from the IPCC AR5 report, table 2.2 (on page 64), shown below. It is noted as the total global carbon budget starting from the year 1870 needed to stay within 2°C. Note that the table acknowledges a broader uncertainty range — from 2900 to 3200. This interactive focuses on CO2, the primary (but not the only) greenhouse gas. It does not explore possible changes in methane, N2O, and f-gas emissions that could also help limit warming. As a result, CO2 emission reduction rates are more severe than other scenarios that would still limit warming to within 2°C and also include reductions in other gases. However, even with reductions in other gases, the level of ambition illustrated in the interactive is representative of what is needed to keep global temperatures “well below” 2°C and aim for 1.5°C, as the Paris Climate Agreement calls for. No Change. This is the business as usual or reference scenario behind the Climate Scoreboard analysis, wherein countries do not take action on climate change and continue to increase their emissions. The scenario is calculated by Climate Interactive based on separate estimates of population, GDP per capita, and carbon intensity of the economies of fifteen regions, aggregated into six for this application. It was revised in 2017 to incorporate changes and policies from recent years. Flatten. Countries and country groups would achieve half of the emissions reductions included in their Paris Agreement pledges by 2025 or 2030 (see below for an example) and then, in 2030, flatten emissions through 2100. Reduce. Countries and country groups would achieve all of the emissions reductions included in their Paris pledges by 2025 or 2030 and then reduce emissions post-2030 at a fixed annual rate, so that emissions are halfway between the “Flatten” and “Eliminate” scenarios by 2100. Eliminate. Countries and country groups would achieve 50% more than the emissions reductions included in their Paris pledges by 2025 or 2030 and then, post-2030, reduce to near zero by mid-century. To reflect differentiated capacities and responsibilities, developing countries reach near zero emissions later than developed countries. 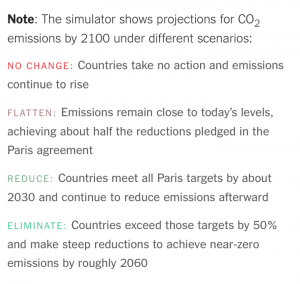 As noted above, three of the scenario choices above involve half, all, or 50% more than the Paris pledges. “Half” means that emissions would reduce 50% of the way between the Reference Scenario and the full pledge in the pledge year. For example, 2025 emissions for the US would be 5.45 Gtons/year in the Reference Scenario (selected with the “Grow” choice) and 4.25 when following all of the Paris pledge (26% below 2005 emissions, selected with the “Reduce” choice). Choosing “Flatten” would lead 2025 emissions to be 4.85, halfway between the two values. And choosing “Eliminate” would lead to 3.65, which is 50% beyond the Paris pledge. In order to simulate futures that achieve some fraction of the Paris Pledges, the interactive includes the Nationally Determined Contributions (NDCs) submitted by nations to the UN Framework Convention on Climate Change. The interactive was constructed with 8,192 unique scenarios developed in C-ROADS. 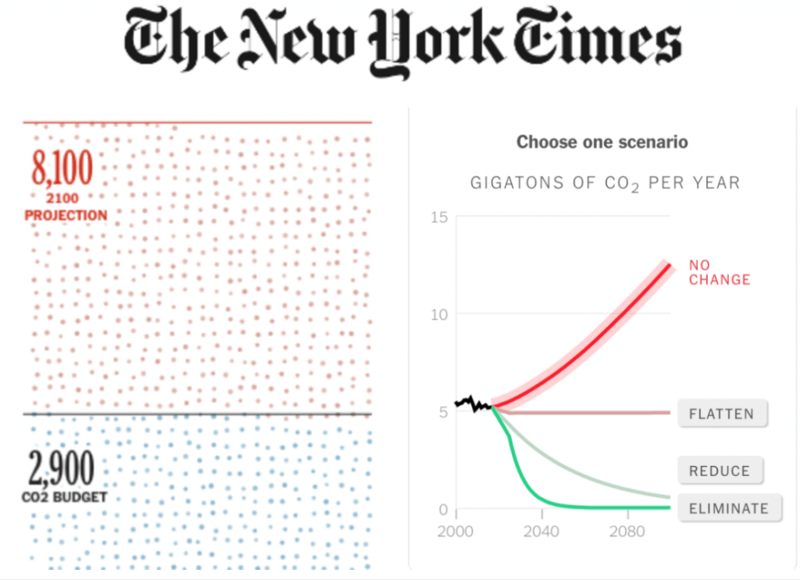 Scenario output that was created but not shown in the interactive includes annual emissions for all six regions, annual CO2 concentrations in the atmosphere and annual temperature. Those data are available upon request via info [at] climateinteractive.org. scale policy intervention (and land) for them to be realized. The scientific literature on the potential for CDR to be successful is varied. Our numbers here are not predictive of what may happen in this uncertain domain — we consider this a helpful “what if” scenario, not a forecast. Division of countries into “Other Developing” and “Other Developed” groups are explained in the C-ROADS technical reference guide.